I have to say there are a lot of things in life they don't teach at school - being a bride is one of them. I've heard different stories, but when I finally get to experience it first hand, I feel super unprepared. Nevertheless, I'm trying to enjoy this phase of my life as much as I could. It's not as hard as I make it sound to be. It really isn't. First of all, let me just sing praise for my very own wedding coordinator, my beloved mom. I do hire a wedding planner, but no one can replace my mom's position in this wedding. She's the most supportive mom, and she's super resourceful. She's the one who went vendor hunting when I was still away. She, with the help of my dear dad of course, went all around Jakarta to plan for my wedding. She could get a bit carried away sometimes when she thinks of every single detail. It may seem like she cares more about the wedding than I do, which is not entirely untrue. This is her first ever wedding to plan, but she's not new in event organizing. Working at humanitarian organization for 32 years, she'd been the go-to person when it comes to organizing and executing events. She should consider this a new career. Planning a wedding is hard as it is let alone planning when you're on a different continent. I just got back home a little less than 2 months before the wedding. We decided to have the wedding in Jakarta instead of in the US because most of our families are in Indo. It just makes more sense (even though the more details I have to think about the more I question our decision). The US wedding culture, at least for most weddings I've attended to, is simpler and intimate. It's not the case for Indonesian wedding. I used to grunt with mockery at the fact of inviting a "friend of a relative who's the second cousin of" which is what Indonesian weddings do. Some of my perspectives have changed since then. 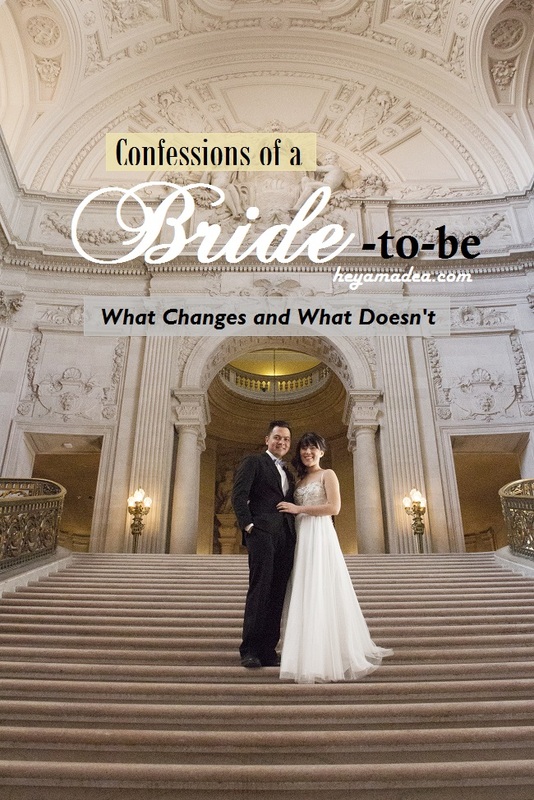 While I had my own expectation about my own wedding, I had stopped to try fulfilling every single one of them and started seeing the bigger picture. Even though it may sound like I'm giving in to "what others want", I think of it as letting go of what's not necessary. The less I stress about what's not important, the more time I have to focus on what is. Wedding is not just about me or my fiancee. It's about celebration of love; it's about family. Some may not agree with this, but I have come to realize that it's not just my wedding. It's our celebration, and I want my happy day to be our happy day. I can't do this on my own. I just can't. I am glad we decided to have the wedding back home where I have my mom and all the support system I need. If I had it in the US, knowing the type of person I am, I'm not so sure things would've worked out very well. I would've been more stressed out. We had agreed early on that we weren't gonna spend our entire savings for a party. We think about the future, and that's where our investments go for. We still prefer a simpler and more intimate wedding with just people we are close with as guests. Wedding is a party that only lasts for a couple of hours. The real work is to make a marriage that lasts forever. We can't rely on our own strength. We need God's guidance and strength. If you have any experience preparing your wedding or piece of mind or opinion, please do let me know!